On to bigger and better things ... Kant's Critique of Practical Reason, in which he gives us a fantastic answer to that most important question in philosophy: "What is the Right Way to Live?" Kant thought about the meaning of free will. What is free will and what is it good for? He said when we ignore our desires, our lizard brain, we exercise free will. And it is this power that allows us to act in accordance with moral law. Thus, the thing that separates us from the animals is our ability to exercise morality. He uses this reasoning to formulate his most famous treatise: the Categorical Imperative. Reason tells us that we should resist desire when we cannot support the same behavior in others. For instance, we shouldn't steal when we cannot endorse someone else stealing from us. It is the Golden Rule, found stated one way in another in all major world religions. "Do Unto Others." This is the foundation of all morality everywhere in the world. But what sets Kant apart is that he didn't arrive to his conclusion by God blasting a trumpet in his ears. He came to it by reason and reason alone. And thus he shatters the idea that wihtout God there can be no morality, even as he remained a devout Christian. 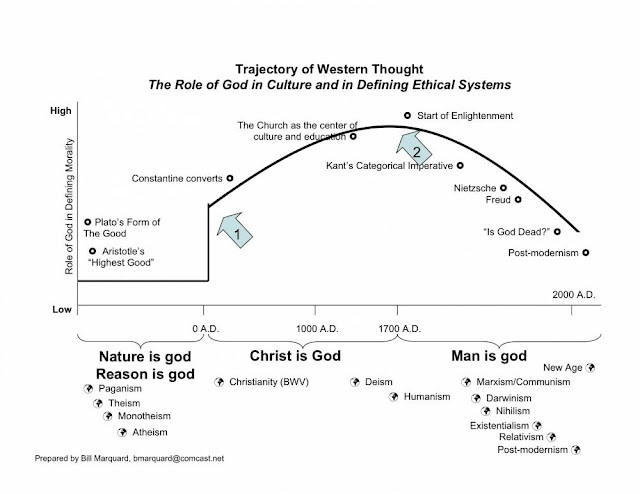 Pick up any book on morality today and its not Jesus that is quoted, but it is Kant and his Categorical Imperative. 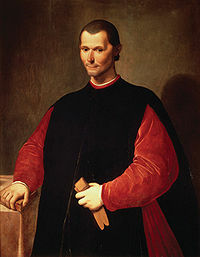 Machiavelli: "It is better to be feared than loved"
Kant was convinced, perhaps a bit optimistically, that because we all share the same faculty of reason, we should all reach the same conclusions regarding morality. And to be honest, any sane person has to agree with him. The problem as Machiavelli pointed out earlier is that moral behavior, though understood by all, is not always the best path to personal gain. I have talked about all this extensively in my posts on morality, but I want to share a final thought on this topic. Although you could indeed live a just and moral life based on the Categorical Imperative, there is a problem with it. Its hard work. Who wants to be a moral person when its so much easier and more pleasurable to be a lazy selfish slob? To find the answer to this dilemma we have to jump in a time machine and return all the way back to the beginning: ancient Greece. Aristotle didn't believe in universal rules on how to live, instead he believed in the Virtues. The Greeks valued things like generosity, courage, honesty, and good looks (I'm pretty sure about that last one). They believed that the ideal person lived these virtues through and through. They weren't one-off acts they did when they felt a good impulse; they were ingrained in the very fabric of the person. How was this possible? How could one always act virtuously? Aristotle believed that when you lived the virtuous life, you became content with yourself and found true happiness. In fact, the only way to true happiness was the virtuous life! This viewpoint answers the problem of moral motivation I raised above. If you view living in harmony with the Categorical Imperative or Jesus' teachings as an end in itself, as the true path to happiness and contentment, then you enjoy living the moral life. Doing the right thing isn't some bland duty or obligation, its something that makes you feel better each and every time you do it, and eventually it becomes who you are. 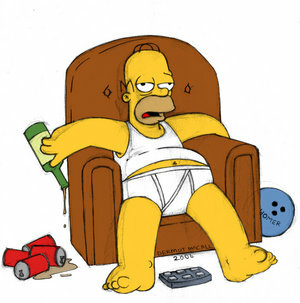 Picture the selfish slob Homer Simpson. He is a good guy at heart, but he is ruled by his base desires. He makes decisions from his lizard brain. Every once in awhile, the chaos and destruction caused by his life piles up so deep that he is forced to confront his ugly nature. In these rare moments of insight where his superego slaps him upside the head, Homer realizes there is another path. He often ends up doing the right thing in the end and tries to atone for his misdeeds. Each episode of Homer's life is "instant karma," where he reaps what he sows. But Homer has not trained his mind like a yogi, his sattva self is too easily overwhelmed by his raj. Soon he is drinking beer on the couch again, leading a life of miserable hedonism. Contrast Homer's life with Flanders. 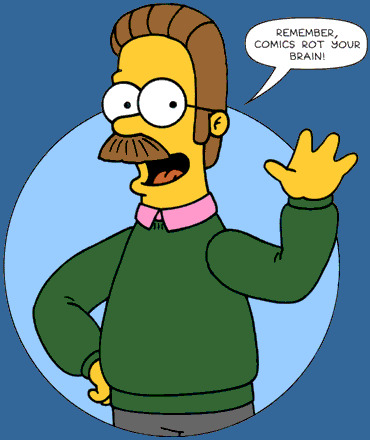 Flanders is Aristotle's ideal virtuous man. Flanders is happy and content with his life. He is always smiling, whistling, his kids are perfect (if a little to likely to get their butts kicked at school). The light of virtue (or God) shines through Flanders so bright that it constantly reflects Homer's own depravity back at him. But this idea of virtue making one happy, and in fact being the only path to true contentment, is also found in Buddhism. In The Art of Happiness, the Dalai Lama goes on at length about empathy and compassion for others. He postulates that when one acts in good faith towards others, to act selflessly at all times, those actions serve to build trust and respect from others. It reinforces relationships and makes them strong. Such people have much better connections with family, friends, and co-workers. Humans are hyper-social animals, and the strength of our relationships directly determines the fate of our happiness. Thus, acting morally makes us happy because this is the only way that we can truly have a strong circle of family and friends. People that will be there for us through all the ups and downs of life. Of course ... in the end who would you rather hang out with? C'mon, that's an easy one. Perhaps its best to be Flanders during the week, but on the weekend look out: its Homer-time.